Bed bugs get their name from spending most of their time around mattresses, box springs, and normally within 8 to 10 feet around the bed area, but they can also hide in other places like behind picture frames, under floorboards, or behind light switches. Bed bugs are small, flat, and reddish-brown in appearance, and are only about three-sixteenths (3/16) of an inch in length. Bed bugs are considered a parasite because they feed on human blood, or the blood of small animals and birds. They can, however, live up to one year without feeding. Even if your home is clean, bed bugs can enter the house via used furniture, luggage, or other items from an infested zone. Consulting us, the Bed Bug Experts in Delaware, is the first step in getting rid of your pest problem! The detection of bed bugs can be a very tricky and complex process, and the ability to detect these bed bugs during the early stages of an infestation when only a few bugs are present is absolutely critical. With the help from Ladybug’s certified detection beagles Daisey and Dolley, the accuracy of early detection of those pesky bed bugs increases to a 90-95% accuracy over a 30% accuracy from a regular visual inspection from a technician. Detection dogs are also a more safe alternative to pesticides being used. If pest control technicians are able to find out directly where the bed bugs are located, they can decrease the area that needs to be sprayed. Detecting that you have bed bugs in your home is not always as simple as you might think. Research shows that about one in every twenty people will show a reaction to a bite from a bed bug, so learning to keep an eye on these signs of a bed bug infestation are important. 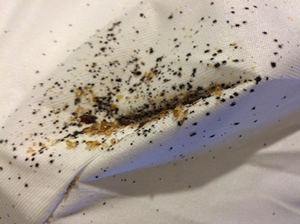 Small spots of dried blood on or around the bed, or tiny black dots that resemble the look of pepper are a sign that bed bugs are present and have been feeding. Their bites sometimes appear in a streak of three bites close together anywhere on the body. 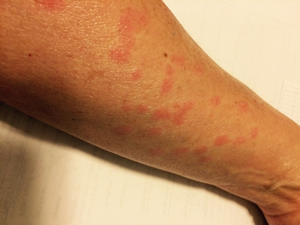 These bites will create tiny red welts and will be extremely itchy, and could eventually even blister. First things first, if you know you have bed bugs, we will schedule an initial inspection at your home, hotel, or apartment unit, office, group home, nursing home, school, etc., anyplace that is suspected of having bed bugs. If you are unsure if you have bed bugs, we can schedule an inspection with one of our 3 Canine Bed Bug Detection Beagles. They are trained and certified to sniff out bed bugs and/or their eggs. Once we identify that you have bed bugs and make an assessment of the level of bed bug activity, i.e., a low level introduction or a higher level infestation, we can plan the proper treatment plan. We are your local bed bug experts serving many communities, including Salisbury, Maryland and Delmar, Delaware. Prior to any treatment, Ladybug will provide instructions and/or a preparation checklist for you to review. Please be sure to be as thorough as possible with your preparation so that we can be as thorough as possible in our treatment. Depending on the level of preparation, we may need to reschedule the treatment until the conditions are optimal. You should see the results of the treatment within a week after our visit.